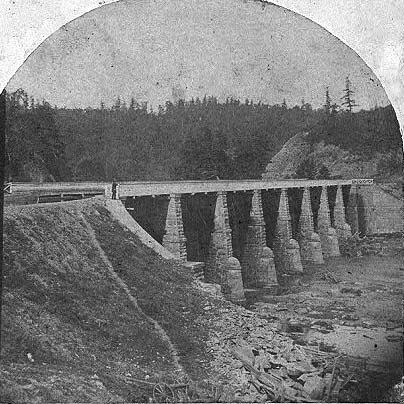 "Canalduct near Portage, Genesee Valley, N.Y"
This image shows the aqueduct in Portageville which carried the Genesee Valley Canal fifty feet over the bed of the Genesee River. The view was taken from the south looking toward the present day Park. The aqueduct consisted of a wooden trough 400 feet long supported by seven stone piers. You can still see the abutments, wing walls and the remnants of some of the supporting piers today. For another view of the Aqueduct, see Image 92.